BEIJING, May 17 (Yonhap) — “Jade Lover,” a TV series co-produced by South Korean and Chinese companies, has been approved for broadcast in China, informed sources said Wednesday, further raising prospects of Beijing lifting a blanket ban on South Korean culture products. “‘Jade Lover’ has been confirmed for broadcast on several Internet platforms, including Tencent, and regional satellite networks in China,” said a China-based source with deep knowledge in bilateral show business relations. 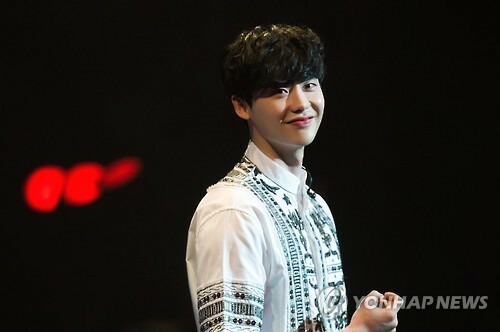 The fantasy romance series, starring South Korean actor Lee Jong-suk, was co-produced by South Korea’s Wellmade Yedang and Hong Kong-based media group DMG. “We’re being asked a lot about ‘Jade Lover’ from people here,” said the source, adding that the South Korean entertainment industry circle in China is waiting for Beijing to entirely lift the ban on South Korean culture products. For the past year or so, China virtually banned South Korean cultural and entertainment products in protest of Seoul’s decision to set up a Terminal High Altitude Area Defense battery on its soil. Seoul says it is to better prepare itself from the ever-rising military threats posed by North Korea, but Beijing believes the THAAD system can be used to monitor its own military activities, thereby hampering regional peace and stability. A comedy created by a South Korean TV producer based in China has also been reportedly green lit for broadcast this month, after being blocked from airing by regulators for months. Earlier this week, news came that three original Korean musicals — “Bballae,” “My Bucket List,” and “Vincent van Gogh” — will soon open in China, raising hopes that China’s recently shut door to South Korean entertainment products will finally open up again. South Korea and China are seen as moving toward mending strained ties as exchanges and contacts in diverse areas have apparently been gaining traction since the inauguration of South Korean President Moon Jae-in. © VISUAL DIVE. All rights reserved.